Theresa May the British Prime Minister may likely withdraw parliamentary vote on her brexit deal. Ms May convened a conference call with senior ministers on Monday to discuss what do with her compromise deal that allowed the United Kingdom to exit while staying in the EU's orbit. While there was no official word on the vote, two sources told that the vote was being pulled. A reporter said an official close to the cabinet had also confirmed the vote would be pulled. 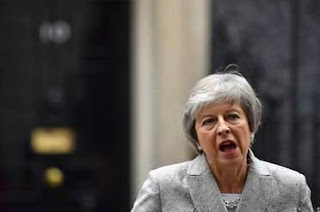 Ms May is pulling a parliamentary vote set for Tuesday on her Brexit deal, after repeated warnings from lawmakers that the scale of the expected defeat could sink her government. Ms May and her ministers had repeatedly insisted the vote would go ahead as planned. Her spokeswoman briefed reporters on Monday that there was no plan to pull the vote.